When you create a Preset Profile, you can include attributes for locking, automatic renewal status, domain name forwarding, masking, contact information, and nameservers. Note: You can use Preset Profiles to bulk change contact information. Just add any number of bulk domains to the same Preset Profile and then change contact information for all (see below under Contacts). Contact infomation for domains with Private Registration cannot be changed using Preset Profiles. 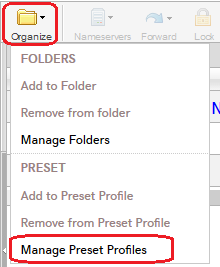 From the Organize menu, click Manage Preset Profiles. Enter the profile name and optional description. Locking - To lock or unlock all domain names in the profile, activate the attribute and indicate the lock state. Auto-Renew - To set auto renewal for all domain names in the profile, activate the attribute and indicate the auto renewal state. Forward only - To forward the domain name to a separate URL. See Manually forwarding or masking your domain or subdomain for information on completing forwarding fields. Enable Masking - From the Masking tab, select Enable Masking. See Manually forwarding or masking your domain or subdomain for information on completing masking fields. Nameservers - To update nameservers for all domain names in the profile, activate the attribute and complete the fields. See Change nameservers for my domains for more information. Contacts - To add specific domain name contact information for all domain names in the profile, activate the attribute and complete the fields. See Change domain contact information for more information. How do I create a ".com/pagenamehere" ?